Recipe submitted by Lee Anne Mills, Senior Marketing Manager of Professional Services & Consumables Division, Wal-Mart. I scream, you scream, we all scream for ice cream! So why not add to the "health experience" by adding some granola and fresh berries! Granola is simple to make and fun to eat. 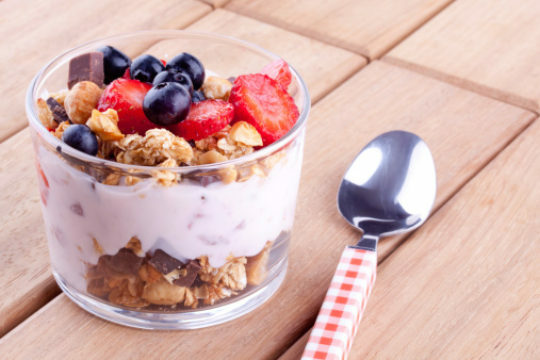 Mix together nuts and fruit to make a healthy granola snack. You might even eat it without the ice cream. Preheat oven to 275 degrees. Lightly coat a sheet pan with canola oil. Combine oats, oat flour, nuts, cinnamon and salt in a medium bowl and mix well. Combine apple juice concentrate, pineapple juice concentrate, coconut milk, brown sugar, vanilla extract, cashew butter and maple syrup in a small bowl and mix. Add to dry mixture and mix until ingredients are moist. Crumble mixture onto sheet pan and bake for 45 minutes to 1 hour, stirring after 25 minutes to allow for even cooking. Remove granola from oven, break apart while still slightly warm and add dried fruit and honey. Cool on sheet pan. Use as a topping on your favorite frozen yogurt, or eat the granola plain! Makes 12 (1/2 cup) servings. Baker's Tip: Mix together nuts and fruit to make a healthy granola snack. You might even eat it without the ice cream.